We have a new challenge for at you at Freshly Made Sketches. This weeks sketch has been designed by the amazingly talented Kim Singdahlsen. I’ve been waiting for my latest order to get my hands on Blended Seasons. I should warn you now that it will probably, no definitely, feature on a lot of my cards. This stamp has all three flowers with leaves joined into one stamp, but for my card I fussy cut the flowers and separated them so they could layer around my sentiment. I watercoloured the flowers with a touch of Pool Party and Blueberry Bushel Inks. Instead of using the leaves that come with the stamp, the leaves I’ve used on my card are from Tropical Chic. I stamped the leaves in Lemon Lime Twist and then fussy cut them out. How amazing is this sentiment I’ve used on my card? I can see it used on so many of my cards that I like to give friends for just being them. It’s also from Tropical Chic. 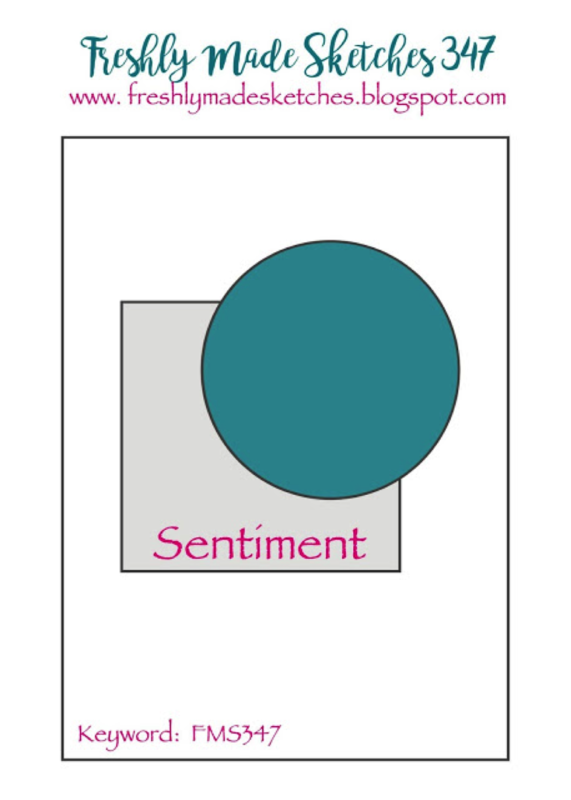 The Pool Party square of DSP that I layered under the circle is from Subtles 6″ x 6″ Designer Series Paper. To finish off my card I decorated the corners of my card using this stamp from Around The Corner – a set that is perfect for jazzing up cards. As always, the Clean Team have nailed the sketch challenge. Pop over to the challenge and see how wonderful their cards are. 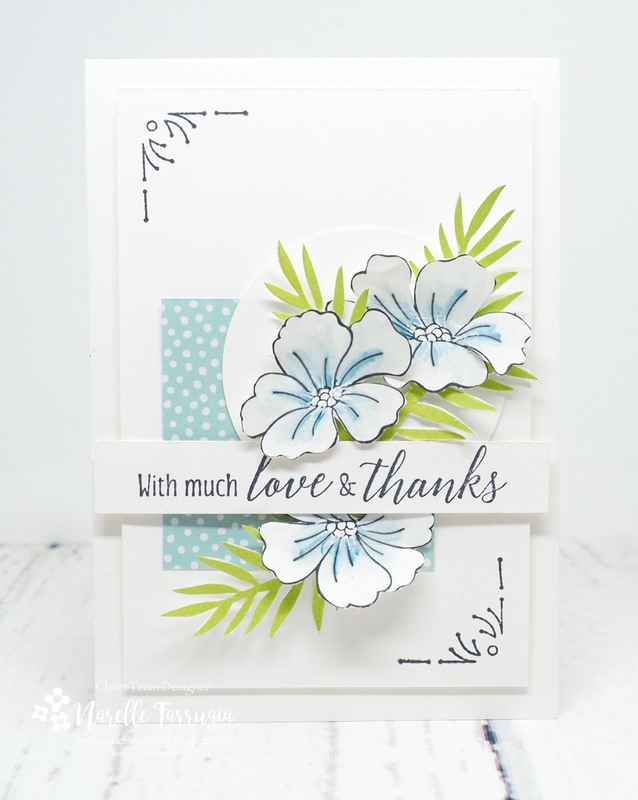 I love the soft blue flowers and the tropical chic leaves are wonderful! I may have to break down and buy that set! Beautiful card! This is so fresh and airy! I love the mix of sets you’ve used, and I can’t wait to see what else you do with the Blended Seasons set. Beautiful card. Love the soft colors and that flower set. The tropical leaves look great with it. I am anxiously waiting to get it. Thanks for the inspiration. Very soft colours,wonderful fussy cutting ,sweet …. Beautiful – I was trying not to buy this set but not so sure I can resist now!! This is amazing! Beautiful card. I wonder if you have ever added up all the time you’ve spent fussy cutting out your images! You have more patience than I could ever hope to have!! Such a lovely card! The flowers are gorgeous and I love the fresh colors. The detail on the corners is a wonderful touch! This card is just gorgeous! I love those flowers and the leaves! The colours are so soft and pretty! What an amazing take on the sketch! Those flowers are just gorgeous! Such a light and airy card – so gorgeous!